For a limited time only, enroll in QC’s Event & Wedding Planning Course and Event Décor Course (at 50% off), and you’ll get the Luxury Event and Wedding Planning Course for free! That’s a value of $698! *This promotion is subject to change, alteration, or termination by QC Event School at its sole discretion at any time. Check off the two mandatory courses– the Event Decor Course will show up as 50% off! 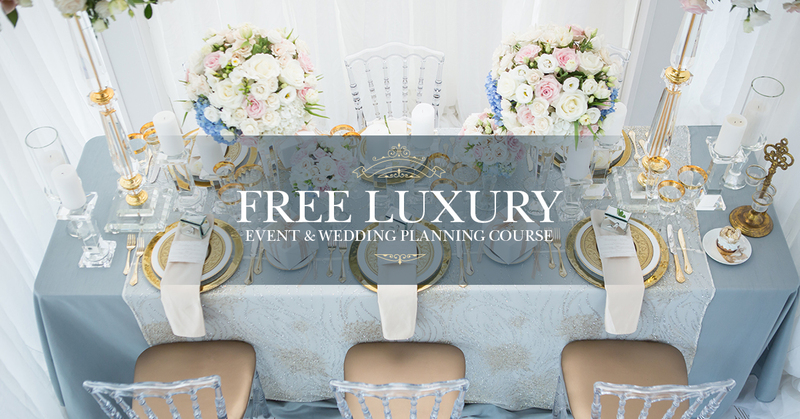 Then select the Luxury Event and Wedding Planning course, which will show up as free! QC’s Event and Wedding Planning course is the first course you should complete, as it teaches you the fundamentals of event and wedding planning concepts and is the prerequisite to all the other courses. Learn to successfully create and organize any type of event from milestone parties, to corporate retreats, to dream weddings. Get industry-ready training and the knowledge to plan unforgettable events from start to finish. Launch a new career in a field you’re truly passionate about. Harness your creative and organizational skills to create complete looks for every kind of event. Learn how to coordinate floral arrangements, lighting, linens, and more. Gain practical knowledge on how to turn your clients’ visions into reality. Learn to work with large budgets, network with high-end vendors and market your luxury planning services. Gain practical training to successfully create over-the-top and upscale events, weddings, parties, meetings and celebrations. Meet and exceed even the most challenging luxury client expectations. This promotion is available with any payment plan. Choose a plan that suits your budget! Choose your installment schedule: For both the Accelerated Plan and Extended Plan, you can choose to make weekly, bi-weekly or monthly installments. You can even choose the day your payments start! Click on the Tuition Calculator to find the plan that fits your budget and lifestyle. Are you ready to take the first step toward a new career in event planning?